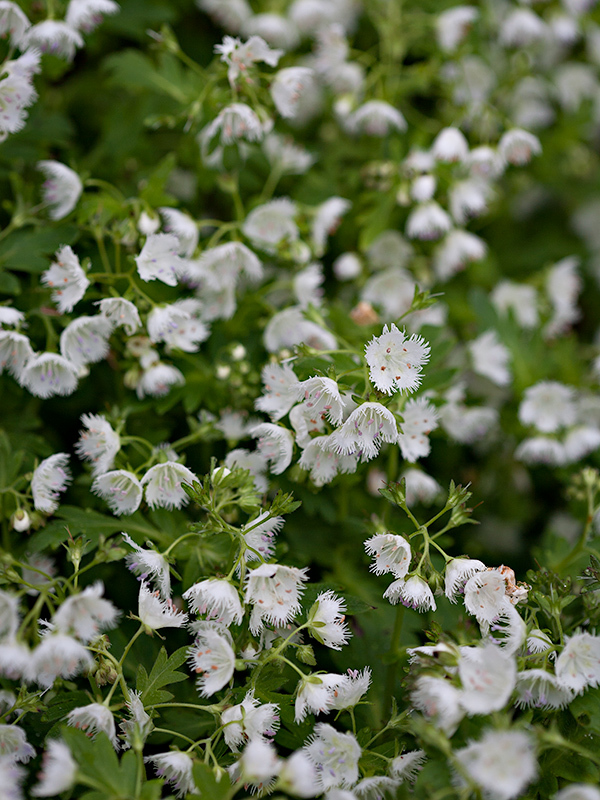 In Wildflowers and Plant Communities of the Southern Appalachian Mountains and Piedmont, author Tim Spira describes Phacelia fimbriata: “In woodland gardens (and in the wild) dense patches of flowering fringed phacelia resemble light coverings of newly fallen snow”. That is certainly what this scene looked like from a distance, when our group traveled to the Great Smoky Mountains in mid-April a couple years ago. Phacelia fimbriata is a common annual species of mid- to high elevation forests in Alabama, Georgia, North Carolina, Tennessee and Virginia. Pursuing the strategy of an annual life cycle is uncommon in forested environments, as annual life cycles are more often associated with habitats of extreme ecological conditions during some of the year. In these harsh environments, it can be particularly advantageous to be a dormant seed instead of a functioning plant needing water during a drought season or oxygen in the root tissue during cyclic flooding. According to Spira, the ecological advantages of an annual life cycle in fringed phacelia are not yet understood. It is known to germinate in the autumn, and then overwinter as a rosette of leaves flush against the ground (protected by fallen leaves and insulating snow). The specific epithet, fimbriata, means to be fringed with hairs. For comparison, see this previous entry on Parnassia fimbriata. For additional photographs, including both close-ups and in the landscape, see this thread on WildlifeSouth Forums: fringed phacelia. wow, very cool and unusual Phacelia species! Great photos, Daniel – and it appears that the “snow cover” of phacelias are growing beneath beeches (Fagus grandifolia v. carolina) with their diagnostic spring-present dangling dried leaves. What a beautiful flower. 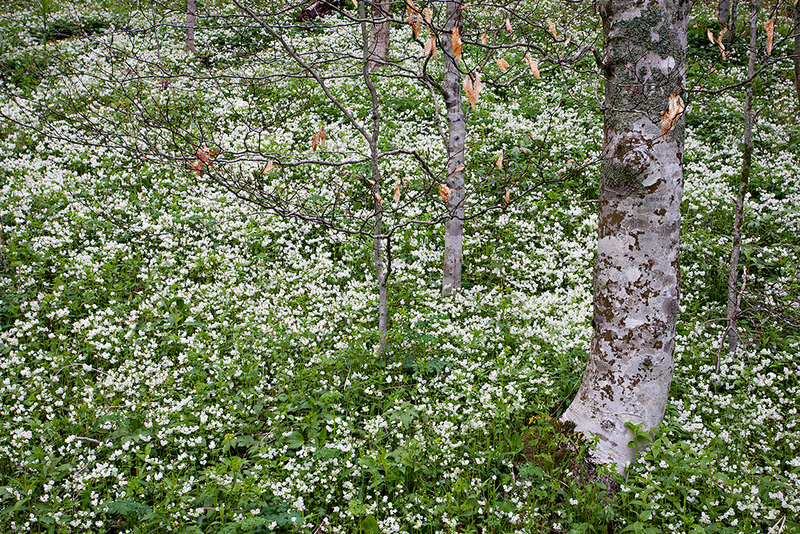 Just gorgeous to see it carpeting the woodland floor. Thanks so much! California’s low-elevation grasslands are dominated by annuals that germinate in fall, overwinter as rosettes, and explode into color as the weather warms. By late May, the soil and the plants dry to a crisp, toughing out the summer heat as seeds. In the eastern deciduous forest the limiting factor for annuals is light: this fabulous phacelia has to mature its seed crop before the expanding beech canopy cuts of the light supply. Why do some plants have fringed petals? It’s also been planted by the Arkansas Highway department along the interstates here in Little Rock. I’ve found it grows in dry glades instead of as a forest herb. The glades are generally moist and wet from fall through spring and are very dry and hot in the summer and early fall – much like the California annuals.